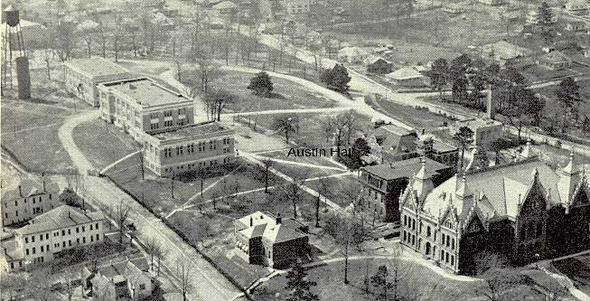 This view of the Sam Houston State Teachers College campus from the northeast in about 1927 shows the historic triumverate of Old Main, Austin Hall, and the Peabody Building lower right. The Sam Houston State University campus landmark--Austin Hall--may seem like just another old building, until you consider what it has been through and what it stands for. First used in October, 1852, Austin Hall is the oldest continuously-used state-owned higher education facility west of the Mississippi. Events in Austin Hall's long history reflect the importance of education to the people of Texas and the citizens of Huntsville, and the struggle and effort necessary to achieve it. General Sam Houston lived just down the hill from Austin Hall, on what is now a part of the Sam Houston State campus, which might have been a geographical accident. But his interest and involvement in the early history of Austin Hall are evidence that he was concerned with more than matters of war and state, but also of education. General Houston helped dedicate Austin Hall on June 24, 1851, holding an umbrella to shade the speaker on that occasion. He was also a member of the first board of governors of Austin College, the Presbyterian school which first occupied the impressive Tuscan-columned building. The building was first occupied in October, 1852, even before it was finished. When completed in 1853, Austin Hall's hilltop location enabled it to be seen at night from an estimated 18 miles away--a true beacon of learning. Austin College's early years were not easy, however. It went through a change in leadership in 1853 after its first president and General Houston had a falling-out over a jointly-owned corn crop, and other matters. The college also struggled financially. It established the first law school in Texas in 1855 in an attempt to increase its prestige and fiscal condition, but gave up the law school two years later. In 1858 there was a disagreement between faculty and students. The faculty objected to a plan by the seniors to hold a graduation dance. The dance was held in defiance, off-campus. The faculty retaliated by withholding the seniors' degrees. Enrollment suffered. The degrees were finally awarded in 1859. The War Between the States, an 1864 smallpox scare, and an 1867 yellow fever outbreak further reduced enrollment. 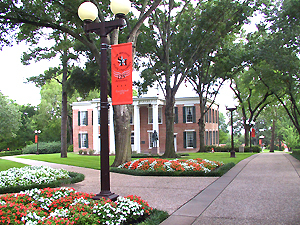 The International Great Northern Railroad bypassed Huntsville, and the Presbyterians decided in 1874 to relocate their college to Sherman, Texas. The Methodist Church acquired Austin Hall in 1877 for $1,000, with plans to use it as a school for boys. That effort failed, however, and the church was happy to sell the building to Huntsville citizens for $346. Influenced by the Huntsville community's offer of a free facility, and with assistance from the Peabody Education Fund, the Texas Legislature located the state's first school for training teachers--a "normal" school--in Huntsville. Sam Houston Normal Institute was created on April 21, 1879, and opened for classes on October 10th of that year. The Institute's first catalogue, which was not published until after the close of the first academic year, listed a "Board of Instruction" that included: H. H. Smith, principal; Oscar H. Cooper, assistant; Mrs. Bernard Mallon, assistant; Mrs. J. R. Whiteside, assistant; and Mrs. A. A. Reynolds, music. Cooper was also listed as the librarian, and Mrs. Whiteside as secretary. That catalogue also listed the names of 109 students. Unlike its predecessor institutions, Sam Houston Normal prospered. In 1881 Austin Hall's cupola was removed so that a third floor could be added to provide more space. By the end of its first 10 years of operation, in 1888, the Normal had grown to an enrollment of 300, and it became necessary to construct a larger building. Thus it was that Old Main was built, beginning in September, 1888, with completion and dedication in September, 1890. Historians believe that the proximity of the two buildings may have indicated a plan to remove Austin Hall, but it was never done. The addition of Old Main also allowed another year of study for students wishing to stay beyond the traditional two-year "normal" program. The small but growing campus soon had another addition. The Peabody Memorial Library was built just east of Austin Hall in 1902--the first library building at an institution of higher education in Texas. It was so named to commemorate contributions of the Peabody Education Fund to the operating budgets of Sam Houston Normal Institute from 1879-1904. The Sam Houston State curriculum was expanded to four years in 1918. The name of the school was changed to Sam Houston State Teachers College in 1923. Austin Hall's third floor was removed during the 1926-'27 academic year, and occasional minor modifications were made from that time until February 12, 1982, when a fire destroyed Old Main and damaged Austin Hall. In those intervening years Sam Houston State continued to grow. In 1965 its name was changed to Sam Houston State College, and in 1969, to Sam Houston State University. Old Main, with its elaborate and memorable Gothic spires, was not rebuilt after the 1982 fire. Instead, a memorial footprint of the structure was completed and dedicated in April, 1987. Although severely damaged, the more graceful Austin Hall was restored, complete with its bell-tower cupola. Scores of student names, carved over the past century or more in its soft sand bricks, were saved. 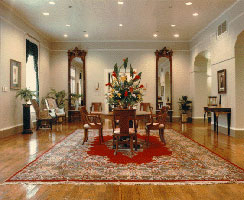 Austin Hall's Greek Revival architectural style was complemented by Early Federal and Empire furnishings, making the building an historical showplace. 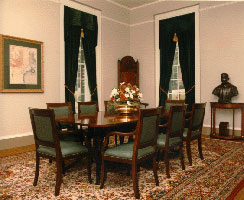 It was re-dedicated in October, 1986 and is used for university receptions, meetings, and special events. It also serves as a reminder of the hopes, dreams, and history of early Texans, and is the architectural symbol of Sam Houston State University--a great name in Texas education.